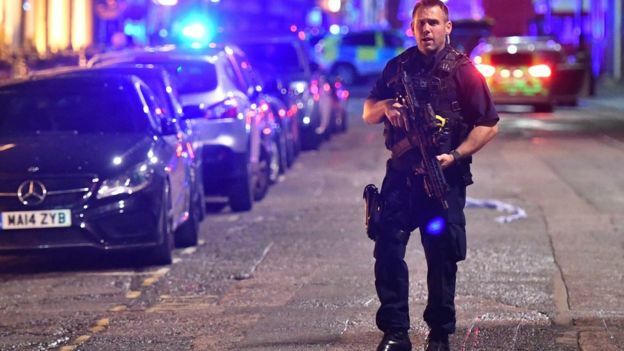 Metropolitan Police Assistant Commissioner Mark Rowley said it was currently believed there were only three attackers involved and the explosive vests they were wearing were “hoaxes”. 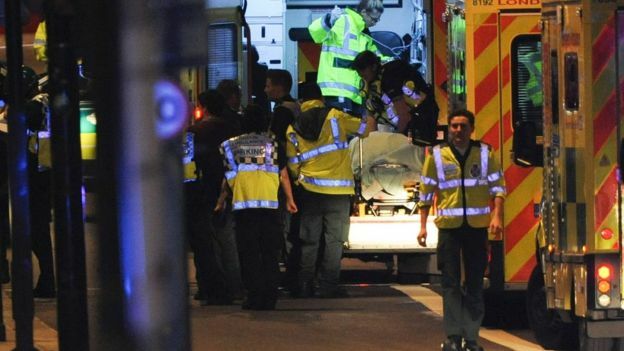 BBC reporter Holly Jones, who was on the bridge at the time of the attack, said the van was “probably travelling at about 50 miles an hour”. 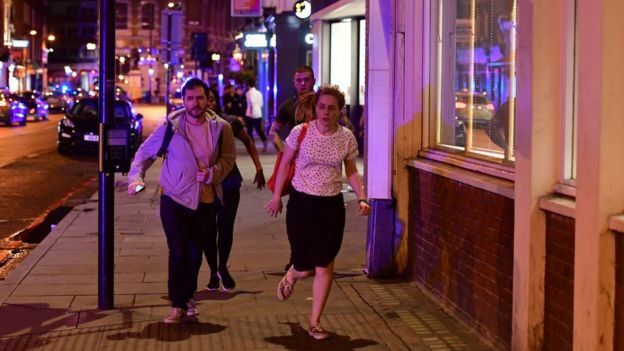 “I saw about 20 or 30 people rushing to get back into the pub and five seconds later a big white van came screeching down the pavement,” he told BBC Radio 5 live. His friend Josh was coming out of the pub a few seconds later and saw people running up to the bridge from Borough Market. 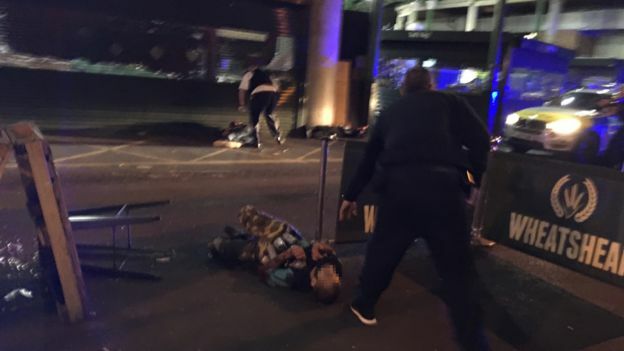 Gunshots were heard in the area while one social media user posted a photograph appearing to show one of the attackers lying on the ground outside a pub in the food market, with what police now say was a fake bomb vest strapped to his body. Eyewitness Will Orton was also in a pub close to the scene. “We didn’t really know what was going on,” he said. “We thought maybe there was a fight or something outside. And then there were almost hundreds of people coming inside. 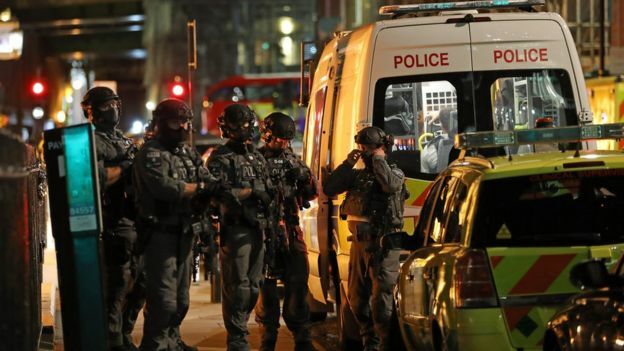 Vilwar Hussein helped carry the injured police officer to nearby Guy’s hospital and recalled seeing a wound in his chest “and blood everywhere”. Earlier, Vilwar said he saw the white van perform an illegal U-turn on London Bridge before driving back southwards along the pavement. 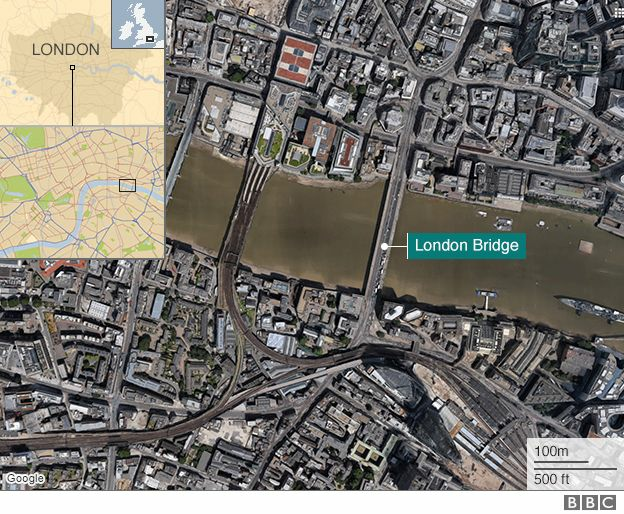 Transport for London (TfL) said London Bridge had been closed in both directions, while neighbouring Southwark Bridge has also been shut. 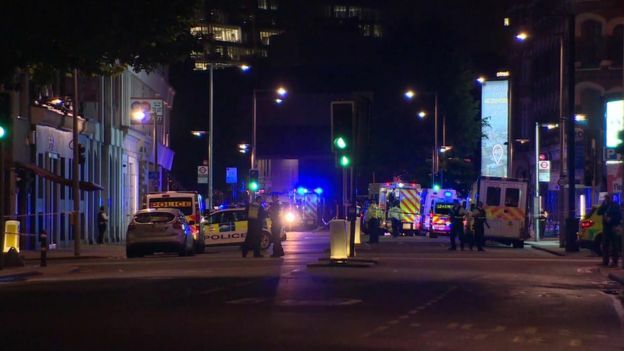 TfL said there were further closures in Borough High Street, while on the north side of the river, road closures included Lower Thames Street. 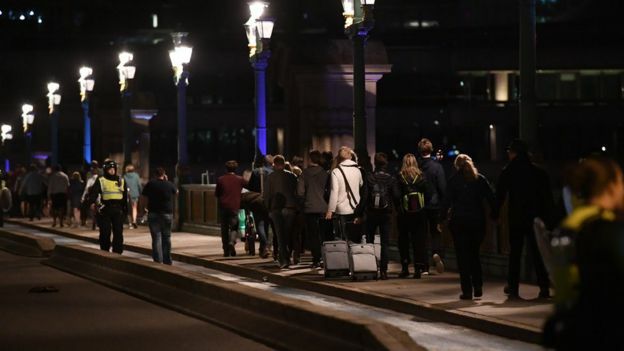 The Met Police has set up a casualty bureau on 0800 096 1233 and 020 7158 0197 for people concerned about friends or relatives who may be affected.